In the summer of 2008, I attended the SeedCamp in London and the winner of that class was a company called Zemanta, out of Ljubljana Slovenia. I was taken with everything about Zemanta; a small team (three founders), out of a place that I had never been to and had barely heard of, winning the SeedCamp with a really smart blogging tool that I just had to have on my blog. USV invested in a seed round that summer that was led by the SeedCamp folks and Eden Ventures. Zemanta was USV’s first European investment. Today, we have ten out of sixty-seven active portfolio companies (~15%) based in Europe. The seed investment in Zemanta led to a nine year journey with Bostjan and Andraz, who founded Zemanta along with Ales. The blogging tool is amazing. 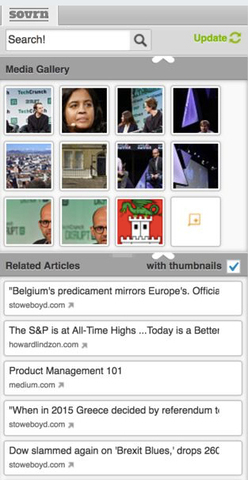 It recommends links and images in real time as you type into your blogging tool. I still have it running in my WordPress web application. It looks like this right now. Zemanta sold the blogging tool to a company called Sovrn a while ago and refocused on the native advertising market. They understood how to place related content into a content feed as well as anyone and they decided to focus the company on that. Bostjan and Andraz recruited Todd to lead the new business opportunity. Over the course of the last three years, Zemanta DSP has become the leading buying tool for native advertising. And the largest company in the native advertising market, Outbrain, became their largest customer. So a few months ago, Outbrain asked the Zemanta founders to join their team and help build some important new technology for Outbrain. After haggling for a few minutes, the deal was sealed and Outbrain now has an office and a team in Ljubljana. Like every investment, Zemanta taught me a few important things. I learned how to work with founders from a different part of the world, I learned that Ljubljana is a lovely little city with wonderful cafes and restaurants along a gorgeous river, I learned that you can keep a company alive for almost a decade on less than five million dollars if you have a crack team of product managers, data scientists, and software engineers in a place that most people don’t know about, and I learned that tenacity wins, always. I am pleased that Zemanta has found a home inside a larger company with a bigger opportunity, I am pleased that Ljubljana has a startup success it can point to, and I am pleased that USV is now a shareholder in Outbrain, an investment I mistakenly passed on a decade ago. But mostly I am pleased that Bostjan and Andraz, with a lot of help from Todd, were able to go all the way, from startup to exit, never losing that which makes them special. That’s a big win in my book.